"HOW CAN THE NEW MACBOOK AIR BE FASTER THAN OLD ONES RUNNING AT THE SAME SPEED?" We received emails from two readers who were shocked to find out that their "older" MacBook Airs running at the same core clock speed as the 2010 MacBook Air were SLOWER. So we investigated. Peruse the graphs below and then we will will tell you what we learned. RED bar indicates the fastest result. Uses all available cores to render a 3D model. Measures CPU speed and memory speed. We publish the overall rating. We take our 2 min 30 sec HD sample movie and an iPad optimized preset. We time how long it takes for the two pass conversion. We take our 2 min 30 sec HD sample movie and import it into a project. Then we export it in "Large" format. Looking at the Cinebench results, it is clear that the 2010 MacBook Airs run the test faster than their predecessors. Case in point: The slowest 2010 MacBook Air (1.4GHz) ties the fastest 2009 MacBook Air (2.13GHz). And the 2010 MBA running at 2.13GHz is 63% faster than the 2009 MBA running at 2.13GHz. However, the Geekbench results appear to contradict this. The MacBook Airs (new and old) with the same core frequency get similar overall scores. But a real world app like HandBrake "agrees" with Cinebench. The 2010 MBA (2.13GHz) is 31% faster than the 2009 MBA (2.13GHz). Still not convinced? We added an iMovie graph showing it 22% faster. So why are the 2010s faster than the 2009s? The best explanation I have heard so far was posted on Apple Discussions site by "tronchaviones": Better cooling and more efficient processor. The 2009 runs slower because it gets down-clocked when the processor gets too hot. Big thank you to those who sent us 2008 and 2009 results. If you have a 1.60GHz 11" MacBook Air we need you to run the Cinebench, Handbrake, and iMovie speed tests for us. Emai the mad scientist, . No keyboard backlighting? No problem. 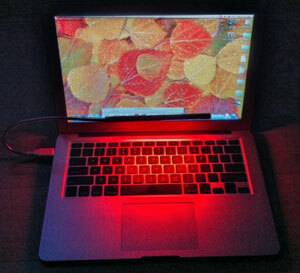 We ordered the Logiix USB Flex Lamp with red LEDs . It's more pricey than some LED flex lamps, but the red LEDs are less harsh than the white LEDs some flex lamps use. And the 10 LEDs are spread out on a tube so the light distributes better to the whole keyboard. We like it so much, we ordered extra ones for our Mac Pro and iMac keyboards. Click on our Apple Store USA text links or display ads when you order a MacBook Air. It's a great way to support Bare Feats since we earn a commission on each click-through that results in a sale.